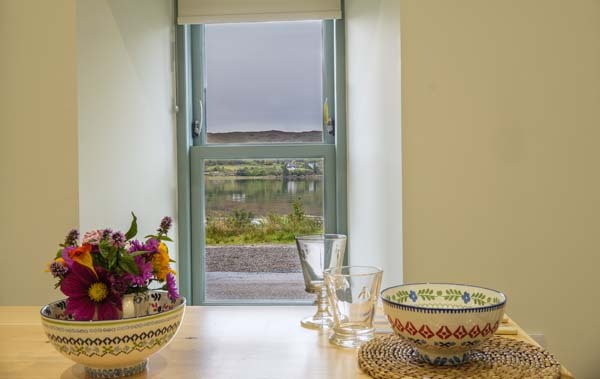 A perfect self-catering cottage, rented out throughout the year, for exploring the west coast Highlands or just relaxing in the stunning surroundings and enjoying the local Scottish seafood. This is one of the most beautiful parts of Scotland and Kishorn is a great place from which to explore the west coast Highlands. It's only 1.5 hours drive from Inverness with Skye, Applecross, Shieldaig and Torridon all under an hour away. The Meeting House is virtually on the sea shore, tucked away on a single-track road, yet only 1/2 mile from the NC500 route - the location is stunning as are the views. You can walk for miles direct from the house not seeing anyone all day once you get into the hills or coastal paths. Serious walkers can get to Torridon, with Beinn Alligin, Liathach and Beinn Eighe (all over 3000ft) in about half an hour by car. The shore in front of the house has a good population of wildfowl, waders (oyster catchers, ringed plover and turnstones are numerous) and other sea birds including eider duck, herons, mergansers and terns. Seals are often visible from the shore, and otters occasionally make an appearance. 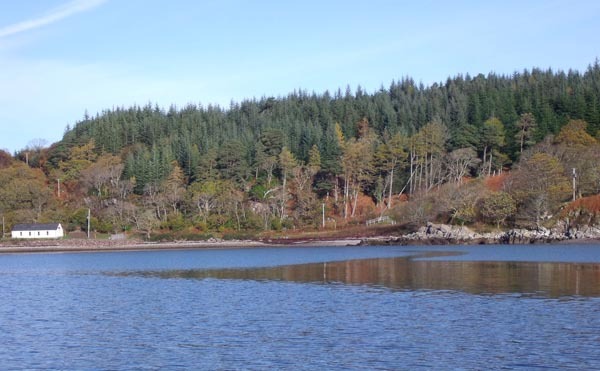 In the summer months, you could see dolphins and porpoises and hear the black-throated divers overhead as they fly to feed from their nests on the hill lochans inland. The Beinn Eighe Nature Reserve is a short drive away. Fishing and kayaking/boating opportunities are everywhere (you can launch small boats and kayaks right in front of the house) and artists are spoilt for choice. Alternatively, you can simply relax in comfortable and beautiful surroundings and wander up to the Kishorn Seafood Bar for delicious lunches and dinners of local seafood. Originally built as a school in 1840, the building was completely renovated in 2018 to an extremely high standard of comfort and facilities. Single storey building, with a very spacious open plan design. 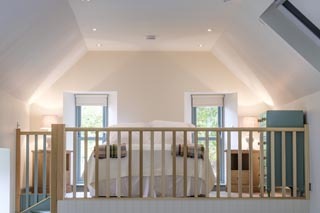 There is a raised sleeping area at one end with a very comfortable king sized bed, made up with quality cotton bed linen. 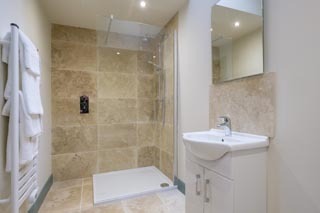 The stone tiled bathroom is at the other end, and has under-floor heating and a luxury walk-in shower. 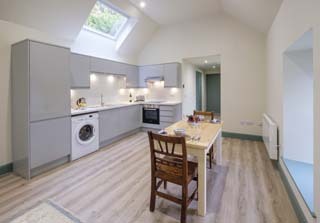 A well equipped kitchen has modern appliances including a Bosch electric oven and hob, microwave, fridge/freezer, dishwasher and washing machine (there are indoor and outdoor drying facilities). There is a dining table and a sitting area with a wood-burning stove and a satellite wall mounted TV. All the main windows, including the dining area, look out over the sea so you can relax and enjoy the glorious views. 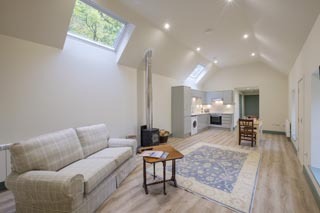 Equipped to a very high standard, and attractively furnished, The Meeting House is cosy and warm all the year round with electric heating throughout and a Clearview wood-burning stove. It's perfect a relaxing or active holiday. A local cook can normally deliver delicious ready-cooked meals, if required - a real bonus if you don't want to cook on your honeymoon or holiday! Kishorn is only 1.5 hours by road from Inverness, and under an hour from Skye. Inverness airport is 1 hour 45 minutes, and hire cars are easily available. Electricity is included. Quality linen and towels. Initial basket of logs included, thereafter modest sum per bag. There is a telephone provided - free landline calls to most UK numbers. The Meeting House is rented out throughout the year. Saturday to Saturday - check out 10am, check in 4pm. 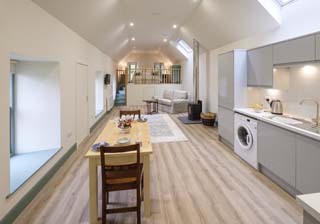 To book this stunning Scottish hideaway, click the enquiry button below to see availability and prices. 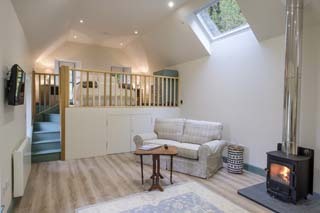 This beautifully renovated property is ideal for a Scottish honeymoon or for couples wanting a relaxing or active holiday. The views are spectacular and it's perfect for re-charging your batteries or bagging Munros - whatever you want to do this is a fantastic bolthole!